thisiswhyyourefat.com pretty much makes me want to be on a diet all the time. but i think this one is kind of ingenious. i don't like jello enough to actually eat it...but it's pretty funny. "Vanilla and walnut flavored Jell-O bun, pistachio flavored lettuce, cherry and cherry cream Jell-O tomatoes, chocolate and chocolate mousse flavored Jell-O burger, orange-lemon Jell-O cheese, lemon-lime Jell-O pickles and coconut flavored Jell-O onions." k. back to packing and cleaning. I love being the first to comment because it often means I am the first to see it! Booyah! 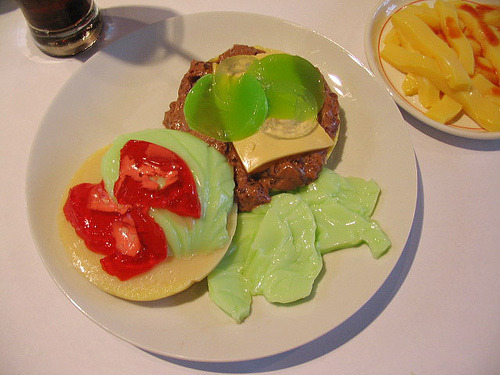 And booyah for the Jello Burger! love it! Before I read the text I kept starring at it thinking...something's not right...why does the burger look shiny? Ahhh!